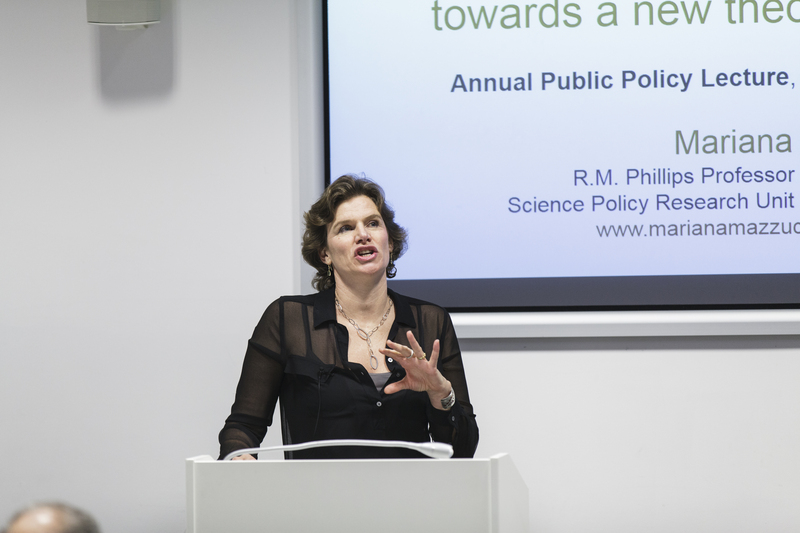 On the 6th of December 2016, the Department of Politics and International Studies (POLIS) hosted Professor Mariana Mazzucato at the University of Cambridge to deliver the Annual Public Policy Lecture. Mazzucato, the R.M. Phillips Chair in Economics of Innovation Science Policy Research Unit (SPRU) at the University of Sussex and the author of The Entrepreneurial State: Debunking Private vs. Public Sector Myths, spoke to an engrossed audience of students, academics, government stakeholders, and others (full video). Professor Mariana Mazzucato presents her lecture “Smart & Inclusive Growth: Towards a New Theory of Wealth Creation” on December 6, 2016 at the Department of Politics and International Studies. Mazzucato highlighted the challenges of defining the State’s role within the modern era of innovation-led growth. She dared the audience to acknowledge the State as a market shaper and creator, and reasoned that the widely accepted paradigm of the public sector serving as the lender of last resort is not relevant. Free markets are not natural. The barter system of the Phoenicians and free markets in the past 8,000 plus years have been the results of interventionism. An economist herself, Mazzucato furthered her conclusion by citing Cambridge economist John M. Keynes who called upon the government “to do those things which at present are not done at all”. Via a four-pronged examination of routes and direction, organizations, assessment, and risks and rewards, Mazzucato explained that public policies need to situate the government as the lender of first resort. She revealed that policy shapes the directionality of change, then steered the audience through examples of mission oriented finance and innovation within the public sphere. Mazzucato recognized the inevitable opacity in policy creation and encouraged public sector organizations to embrace risk and uncertainty. She then evaluated how public sector investments create markets and build launching pads for private sector growth. Lastly, Mazzucato offered eight ways to nurture a mutualistic bond between public and private sectors. The lecture was followed by a lively QA session featuring discussion about attracting top talent within government organizations, inspiring public policy students to take an interdisciplinary approach to problem solving, investing in major public initiatives such as fracking in the US and High Speed 2 (HS2) in the UK, and learning from so-called policy failures. Audience members, including the 2016-2017 MPP cohort, were left with an abundance of ideas and questions to consider. Is the State truly an interventionist entity? Should public policy create enabling conditions or intervene directly? How does public sector activity serve as an impetus for venture capital investment? What can be learned from China’s 5 year $1.7 trillion dedication to renewable energy technologies? How can public policies maximize well-being and wealth creation? What is the public good? How can or should the landscape of picking winners through public funding be managed? Is the State, the source of many general purpose technologies (GPTs), an entrepreneur? What tax policies are suitable in a world of smart and inclusive growth? Professor Mazzucato helped the MPP program with a thought-provoking close to 2016 and left us eagerly awaiting a new year of policy, innovation, and impact. The Annual Policy Lecture is available to view in full online here. Our thanks to PA Consulting for their support which made the Annual Policy lecture possible. This entry was posted in Uncategorized on January 10, 2017 by Finbarr Livesey.